The End PJ Paralysis campaign has taken centre stage as part of Occupational Therapy Week, as staff at Harrogate District Hospital donned pyjamas to support the initiative. 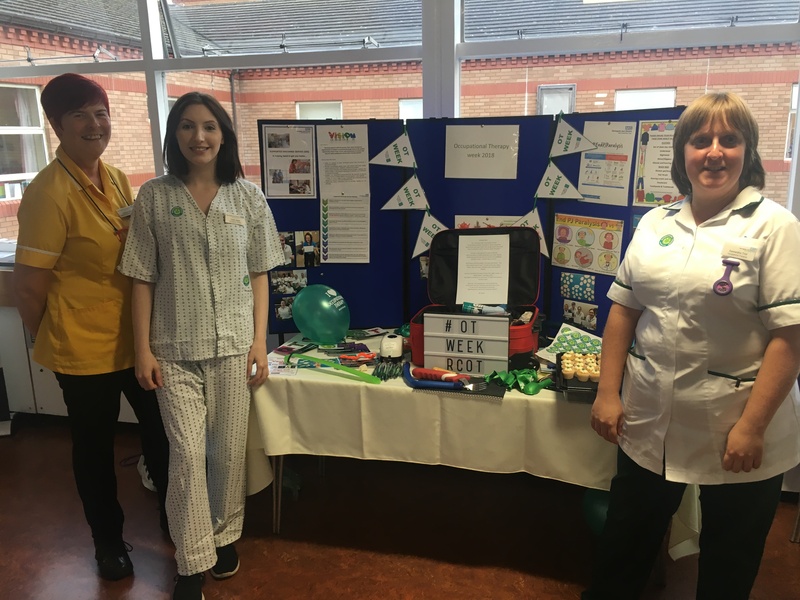 Staff decided to wear their pyjamas to raise awareness of the End PJ Paralysis campaign, and occupational therapists across the Trust have been promoting of Occupational Therapy Week with a stand at Harrogate District Hospital across the week. The stand contains information on what occupational therapy is, what occupational therapists do and recent developments within the Trust that have been led by Occupational Therapy. End PJ Paralysis is a global social movement embraced by nurses, therapists and medical colleagues, to get patients up, dressed and moving. Having patients in their day clothes while in hospital, rather than in pyjamas (PJs) or gowns, enhances dignity and encourages independence, and, in many instances, shortens a patient’s length of stay. Occupational Therapy Week 2018 is led by the Royal College of Occupational Therapists, and offers an opportunity for occupational therapists to promote their profession; and also encourage other people who have benefited from occupational therapy to tell the difference it has made in their lives. It takes place from 5-11 November. Emma Havercroft, Professional Lead for Occupational Therapy at Harrogate and District NHS Foundation Trust, said: “We are delighted to be supporting the End PJ Paralysis campaign as part of Occupational Therapy Week 2018. It is great that so many of our occupational therapy colleagues are supporting the initiative and even donning their own pyjamas to raise awareness. Occupational therapists at the Trust work with people of all ages to help them overcome the effects of illness, injury, disability or accident and enable them to lead full and satisfying lives as independently as possible. The Occupational Therapy Team works in many areas across the Trust and offers a variety of services. For more information on Occupational Therapy at Harrogate and District NHS Foundation Trust, visit www.hdft.nhs.uk/services/therapy-services/occupational-therapy.